Verify that no cables will be damaged or will interfere when the server is extended. 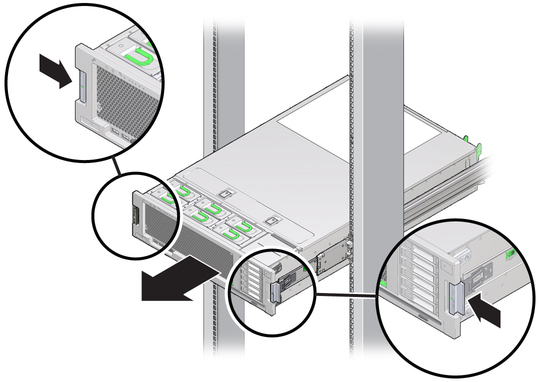 Although the cable management arm (CMA) that is supplied with the server is hinged to accommodate extending the server, you should ensure that all cables and cords are capable of extending. From the front of the server, release the two slide release latches. Squeeze the green slide release latches to release the slide rails. While squeezing the slide release latches, slowly pull the server forward until the slide rails latch.